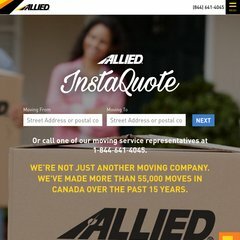 Topics: Overseas, Local Movers, Moving Basics, Moving Checklist, and Moving And Packing Tips. The site has about 80 users daily, viewing on average 2.40 pages each. It is hosted by Hosting Metro (New York, New York,) using Microsoft-IIS/7 web server. Its 2 nameservers are toroondcnszs02.srvr.bell.ca, and toroon63nszp02.srvr.bell.ca. The programming language environment is ASP.NET. PING alliedca.failover.us.com (66.199.185.15) 56(84) bytes of data.